(Stingray Swim Club): The February 2-3rd Island Heritage Sprint Plus swim attracted over 150 swimmers from Stingray Swim Club (SSC), Camana Bay Aquatic Club (CBAC) and Team TI (TI) and was characterized by PBs, CARIFTA times achieved or lowered and events swam for the first time. 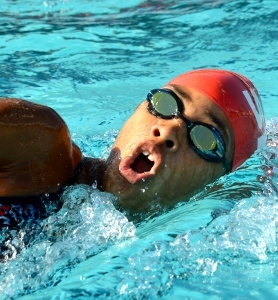 The Sprint Plus, still a relatively new format in Cayman, allows swimmers to compete in the usual 25m (U6 and U8 swimmers) and 50m Sprint events as well as the longer 100m and 200m sprints or middle distance events as well. Stingray Swim Club’s Head Coach, Andy Copley was encouraged by the meets results – especially those of some of the club’s younger swimmers. For the second year in a row, Island Heritage’s High Points awards were unique Stingrays purchased locally from Pure Art. High Points winners were: Girls 6 & Under Sofia Bonati (CBAC); 7-8 Allyson Belfonte (SSC); 9-10 Sabine Ellison (CBAC); 11-12 Alison Jackson (SSC); 13-14 Lauren Hew (CBAC); 15 & Over Danielle Boothe (CBAC). Boys 6 & Under Cian Anderson (CBAC); 7-8 Stefano Bonati (CBAC); 9-10 Corey Westerborg (SSC); 11-12 Zachary Moore (CBAC); 13-14 Rory Barrett (CBAC) and 15 & Over Iain McCallum (SSC). Swim officials are all volunteers who put in a significant number of hours in the classroom and on deck to officiate thereby enabling the swimmers to have their qualifying times and records formally recognised at home and overseas. It also helps the swimmers focus on the rules for each stroke and correct their mistakes prior to heading out for an international competition. Stingray Swim Club members will next see action in the CIASA National Championships, February 20-23rd at the Camana Bay Aquatic Centre pool; and then the Walter Rogers Age Group National Championships in Kingston, Jamaica at the National Stadium pool. This is a long course event and will see some swimmers competing in a 50m pool for the first time, while others will be hoping to either obtain or drop CARIFTA qualifying times … for CARIFTA 2014 which takes place in Aruba, April 22-26th. For more information on Stingray Swim Club visit www.caymanswiming.com .